You Fit How Much On That Boat? A few mornings before Christmas, I woke suddenly and completely with a thought big and crystal clear in my head: We need to sell Don Quixote. I turned to my sleepy husband and pounced on him with this idea. DrC is not clear headed in the morning. Like most men, he can think of only a two things when awakened. One of them is coffee. If I were to get his full attention, it required that I dispose with these ideas first. Moving on, the idea of selling Don Quixote fell on fertile emotional soil. We had seriously been noodling leasing her, but the logistics were a nightmare. Putting her on the hard for a year means a lot of expense and slow degradation of the boat without any real return to us. If we planned to cruise for several years after New Zealand, it would make sense to keep her. However, as I've mentioned before, we do not have that much cruising kitty left... maybe a year at most. Jaime is getting long in the tooth for cruising, Aeron would like to spend longer chunks of time in single locations. This summer tempted all of us with a glimpse of a nomadic land life. The absence of Don Quixote in our life would be a financial relief, but it could also be the lifting of a burden enabling us to consider completely different adventures going forward. Christmas Day found me on the deck of s/v Totem talking with our good friends Behan and Jamie. We were discussing all the options for the future, New Zealand paperwork, and teenagers. Without any prompting, Totem asked me, “Have you thought about selling Don Quixote?” I was struck by this coincidence. Prior to this not a single soul – online or nautical – had asked me whether or not we wanted to sell her. In the cruising world in particular, boat selling and ending the cruising life are topics that no one brings up unless the owner opens the subject. I think it might be taboo. Yet, here was Totem asking about selling Don Quixote before I said anything. “Why yes... we had just started thinking about it. But it seems... it seems like a really big idea.” I'm almost babbling. Jaime was less sanguine. When we broached the idea with the girls, we met with mixed reactions. Jaime cried. In her deeply contemplative fashion, Mera thought about the idea and informed us that this made a great deal of sense. She was ready for a new experience. Aeron vacillated back and forth but was largely concerned about Dulcinea's reaction. Rule of Three* strikes again. The immediate plans do not change. We spend the next two weeks moving the boat back to La Paz. There we are going to clean and empty her out since – whether sold or on the hard – she needs to be empty and clean. Then we'll haul her, paint her bottom, and get a survey done. Again, this must be done. We can't sell her like she is, and we can't leave her on the hard without a new survey for insurance reasons. But we'll also be exploring all the many varied options of how you list and sell a boat without spending a fortune. The first is, of course, the ubiquitous hive mind of my blog, Twitter feed, and Facebook account. 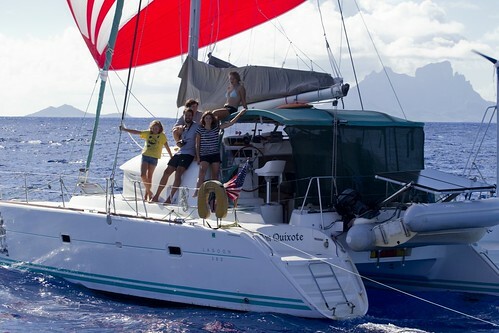 If you know of anyone considering buying a Lagoon 380 in the Pacific, tell them now is the time to do so. There are very few of us out here, they rarely go on sale, and when they do, the owners are rarely as motivated and willing to do a good deal as we are. We will put together a web page with her specifications and equipment over the next week, and get it out to the hive mind with a URL as soon as possible. The other thing that does not change is our status of “floating.” If cruising is way of thinking, a form of living without traditional boundaries and in a liquid state of adaptive learning, we continue our cruising life for the foreseeable future. Even without Don Quixote, we can cruise in a tramper in New Zealand or Australia, by train in Europe, via R.V in the United States. We can hike, bike, or park. Ironically, the cruising kitty can sustain us for many more years if we simply change the mode of transportation: Our boat is beautiful but like every boat afloat she is a black hole into which you pour money. I think we needed the comfort and spacious beauty of our Lagoon catamaran to get us out of our incredibly plush, capacious and comfortable land lives. After nearly three years of living on her and two years of moving her from place to place, however, we know how to live much larger with much smaller accommodations, how to do a lot more with a lot less. Believe it or not, the Conger family is ready to downsize and purge. Again. * Rule of Three – If three things happen in quick succession that point you towards or away from a certain course of action, the Fates are trying to tell you something. It is a very good idea that you listen and obey. Wow, what a start to a new year! This will be interesting. The beginning of a whole new adventure! Have you thought about posting in the Cruisers Forums classifieds? Trust a friend to ask the frank questions! :-) I remember when we decided to sell Mau Ke Mana... it was inconceivable one day, and the obvious choice the next. Our reasons may have been different, but when The Next Thing is in front of you, it's easy to charge forward without regrets. Wishing a smooth transition for you! I wanted to take a minute to say a hearty "thanks!!". I'm finally back on a boat (s/v Serenity, St. Croix, USVI.) Just a short visit at this time, but wouldn't have made it without your blog over the past 21/2 years. My intent is to make it a permanent stay starting this coming summer. I'll miss your frequent blogs as to the sailing life, family style. I was doing that a number of years ago, but I kept feeding the boys and we ended up outgrowing (literally) the boat (s/v Frisco Belle). It's been 18 yrs since, so I'm more than ready to become a permanent live-aboard again. Fair winds on your new adventures and thanks again, Toast.